How long before I can run on a stress fracture? Today on the Doc on the Run Podcast, we’re talking how long it should take before you can run on a metatarsal stress fracture. How long before I can run with a stress fracture? Well this is a great question! This is the first question I get from runners when they get a stress fracture like a metatarsal stress fracture in the foot. This could also apply to other kinds of stress fractures, like a tibial stress fracture or a calcaneal stress fracture, or any other stress fracture in your foot. But the real question isn’t how long should I run, everybody wants to think it’s like one answer, like six weeks, four weeks, two weeks, two days, one answer that applies to everybody. That of course is completely absurd. I mean how long does it take for somebody to become a millionaire. It depends on how much money you earn, and it depends on what you do with that money. So if you make $300,000 a year, but you buy a Lamborghini, it’s probably going to take you longer to become a millionaire than somebody who invests all that money. The same thing with the healing process. It depends on what you do, it depends on what you put into your system. It depends on what you do once you put those things into your system, that all can affect your healing rate. We’re going to talk a little bit about this, because it is really a valid question. It’s a question I get all the time, and when I lecture at medical conferences on running injuries I get the same kind of questions from doctors and later next week I’m going to be lecturing at the International Foot and Ankle Foundation Meeting in Lake Tahoe, and I know doctors are going to ask me the same questions that runners ask, like how long should it take for this kind of injury? How long should it take for that kind of injury before I can run? 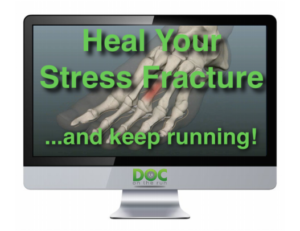 Stress fractures are no exception, they are one of the most common injuries that afflict runners. One of the things that keep runners from running more than anything else. The short answer is this, you can run as soon as the metatarsal bone has healed enough, becomes stable enough, to withstand the stress you apply to that bone when you run. I know that sounds sort of elementary but it’s true. The thing is it all depends on, like I said, how fast you heal and what you do to reduce that stress. The simple answer that doctors give you is don’t run, because they say it’s stressful when you run, it’s hard on the bone when you run and you are running and you cased a metatarsal stress fracture. So if you keep doing that you’re just going to make it worse. Now that is true, but that’s not what I teach runners. 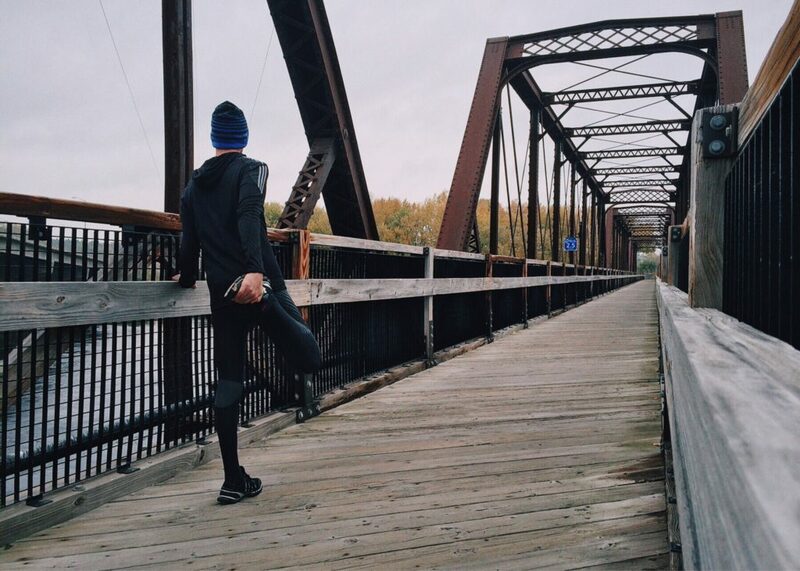 What I teach runners and what I teach doctors to teach runners is that you have to figure out how you can reduce the stress to that particular bone while you run. Like I said if you really want to run you just have to wait until the bone’s stable enough to withstand whatever stress you’re applying to it. That doesn’t always mean that you can’t run, but it does mean three things. The first thing is that you have to let the bone strengthen, in short you have to let it heal some, but the healing process is a continuum of improvement that happens over a long period of time. Initially you have the injury to the bone, then you get collagen forming, stabilizing that little fracture in the bone and then that starts to calcify over time. Then it gets remodeled and becomes stronger and stronger and stronger over time. You don’t have to wait for the entire process to finish before you start using it. You can basically increase your activity level as it gets stronger and stronger. You have to let that healing process begin and there are kinds of things you can do that will improve or slow down that healing process. If you don’t do anything different with your nutrition, you don’t sleep well, you don’t stay hydrated and you keep running on it or jumping rope, or doing something that’s applying too much stress to the bone it’s not going to heal. Initially you need to protect it and you need to make sure that you’re putting materials into your body that you need to rebuild that bone. I know that sounds simple, but it’s simply true. You have to do it, so that’s part of the stuff that we talk about throughout different lessons in the metatarsal stress fracture course about how to actually figure out what you need to do to build up that process of healing the bone and fortify that process so it can happen faster. The second thing you have to do is you have to reduce some of the stress to that bone when you run. So if you’re going to run, and you want to continue to run you have to reduce the stress. There are lots of ways to do that, you can do something as simple as running in a pool. That reduces the stress because it reduces the weight of gravity. You can run an Alter-G treadmill, which is a fancy treadmill that reduces the force of gravity as you run. You can program it to specific percentages of gravity. You can use pads in your shoes to take pressure of the injured bone and apply it somewhere. You can run on a surface that tilts your foot in a way that will actually reduce stress to that injured bone. But you have to do something, so if you keep running in the same that injured the bone in the first place obviously that’s not going to help the healing process. That’s going to hinder the healing process, so you just have to really be thoughtful about this and figure out if you want to run that increases the stress level, but how do you decrease the stress level to that particular bone so you can actually continue running without increasing the stress level applied to the bone when you run? Then the third thing you have to do is you have to monitor it, you have to pay real close attention for the signs that it’s getting worse. That you’re actually re-injuring the bone. You have to look for things like pain, swelling, bruising. They’re all signs that you’re re-injuring the bone. If you’re running on it and you’re ramping up your running, and then you get a huge bruise on your foot. Well what happened, you didn’t drop a turkey on it, something happened. In all likelihood you actually cracked the bone, it bled under the skin, and you saw a bruise. If you’re running and you’re getting bruising, you know for sure you’re making it worse. Now most runners don’t take it that far, but if you’re running and you’re getting an increase in swelling that means that you’re actually applying too much force, because you’re having to rebound inflammatory response. And you get extra fluid in the tissue, and you see swelling. Same thing with pain, if you’re running and it hurts that’s not a good sign. That means you need to reduce the stress more, so that it doesn’t hurt because in all likelihood you’re just applying too much force that bone. You’re applying enough force that you’re actually causing pain. There are lots of other indicators you can look at, but you have to really monitor it very closely and systematically if you really want to continue to run and not make it worse. If you’re really thoughtful about this, if you’re really careful, if you’re really paying attention, if you’re really diligent about doing all of these three things you can get back to running a whole lot sooner than the standard treatments often allow. The last thing a runner wants is to sit around in a fracture walking boot for a month and a half, two months waiting for some magical process to happen where suddenly it’s healed and now you can run. Because then if you do that, once you get out of the fracture walking boot, you get off of crutches or out of the wheelchair you’re basically so weak and stiff you’re more at risk of other over training injuries later. If your goal is really to do another race in a couple of months or four months or six months, or even later this year, then that’s a serious problem because you’re going to be so weak and stiff that it’s going to take you forever to ramp back up to your normal running fitness. During that process you may get re-injured with something else. Remember you must have three things that you must do if you really want to get back to running sooner than the normal patient. When you go see your doctor don’t just take some four week, six week, eight week timeline, or sixteen weeks, whatever they give you, as the normal answer. Just say, well look if the doctor says it’s fourteen weeks before you can run well is that fourteen weeks for me as a young healthy athlete or is that fourteen weeks for all the other old people I saw sitting in the waiting room? Do you tell everybody fourteen weeks, or it only fourteen given my unique set of circumstances? Then if that is true for my circumstances, what can we do, what I can do differently to speed up the healing, reduce the stress on the bone, so I can back to running sooner? You have to remember when you go to the doctor, you must ask the right questions if you want to get the right answers. Just ask them the way that they treat a fracture, that’s not what you want. You don’t want the way they treat every other patient, you want something individualized, customized, particularly for you so you can get back to running. If you have a question that you would like answered as a future edition of the Doc On The Run Podcast, send it to me. And then make sure you join me in the next edition of the Doc On The Run Podcast.